When I was growing up, rusty chain link or split rail lined with galvanized wire ruled the neighborhood, and choosing a fence was all about keeping the dog in or keeping other dogs out. The big house on the hill had a fortress feel, surrounded by a brick wall. Functionality aside, I never wanted to surround my garden with something like that. Today’s fences can be kinder, gentler and much more aesthetically appropriate. You really can choose a fence that meets your functional needs, expresses your personality and makes your house feel at home in your landscape. It’s initially important to determine exactly what you need your fence to do: keep things in, keep things out, provide privacy or security, screen views or provide walls for your garden room. Next, study both the style of your home and the topography of your land to determine the best style of fence for your particular situation — don’t skip this step. This photo shows a thoughtful marriage between home, fence and land. While the wooden panels and seams on the home’s exterior run vertically and horizontally, the graduated horizontal roofline pulls the eye down. 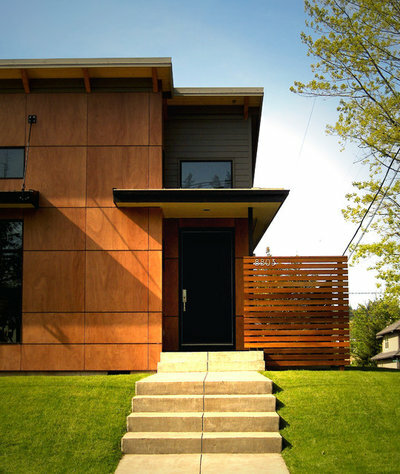 Because of this, the horizontal wooden slat fence, stained to match the home’s siding, is a thoughtful choice. The topography is terraced from front to back, which creates a level surface to build the fence on. If the topography undulated significantly across the grade, this fence would read as too busy and rather like it imposed itself upon the land rather than forging a peaceful relationship with it. Let’s look at different styles of fences and how to thoughtfully choose the right one for you and your home. This traditional style of fence, whether made of old-style iron or updated aluminum, is a go-to choice for much of the East Coast. It creates a polite and proper boundary, keeps most creatures in or out, and allows for passersby to view the home and garden. 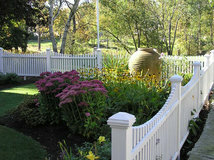 The wrought iron fence is the perfect choice for the landscape shown here. The fence’s shape pays homage to the home’s height, while its black hue contrasts sharply and cleanly with the white exterior. 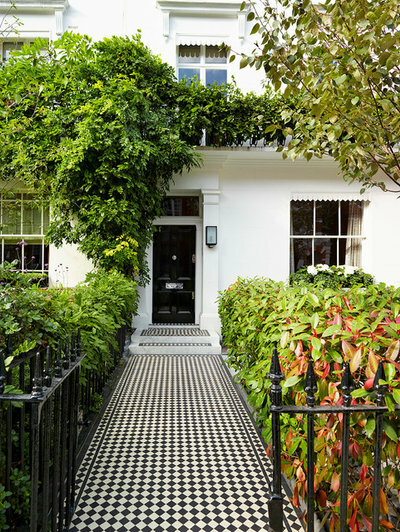 While not everyone has a black and white tiled sidewalk, this one certainly creates a link between home and fence, and grounds the space in a grand way. When to use: A vertical metal fence is appropriate in front of a multistory home, as it raises the eye to see the entire dwelling. When painted a dark or vibrant color, it then pulls the eye back down and grounds the vignette. A lush green planting palette with perhaps just a hint of color finishes the elegant scheme without detracting from each architectural element. When not to use: This type of fence would fight against a low, single-story home, especially if the dwelling had pronounced horizontal lines in the facade. Points to consider: Metal fencing comes in many different styles, from Victorian to contemporary, so be sure to match the fencing style to your home’s style. Since most fences of this type are painted black, you can go as bold or as safe as you prefer with your planting scheme. When to use: When privacy and economy are prime considerations. Some metal can rust or discolor over time, so take this into consideration before choosing this fencing option. When not to use: This type of fence is style-specific, so consider the style of your home before constructing this fence. 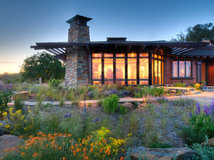 It speaks well to contemporary, farmhouse and industrial architecture but not to traditional styles. Like all vertical fences, it will pull the eye upward; for single-story houses, you should consider another style of fencing, unless there’s a tree canopy you would like to highlight as a focal point. 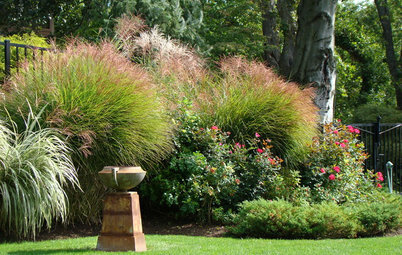 Points to consider: When planting along a corrugated metal fence, consider vertical plants, like certain ornamental grasses, ‘Sky Pencil’ hollies (Ilex crenata ‘Sky Pencil’, USDA zones 5 to 9; find your zone), noninvasive pillar-shaped barberry cultivars like ‘Orange Rocket’ (Berberis thunbergii ‘Orange Rocket’, zones 4 to 9) or trees like ‘Slender Silhouette’ sweetgum (Liquidambar styraciflua ‘Slender Silhouette’, zones 5 to 10). 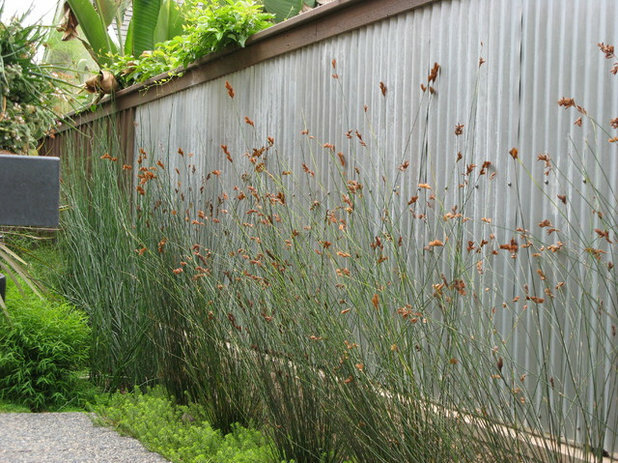 Plants with a vertical growth habit will not compete with the lines of your fencing. This fence type has a much more organic feel than either of the previous materials. It is one of the less expensive fencing materials, and the fact that it can be sealed, stained or painted gives it excellent versatility. When the lumber is tightly spaced, it provides excellent privacy, or the lumber can be spaced out more to provide air circulation and reduce the initial cost. When to use: When privacy and functionality are prime considerations. 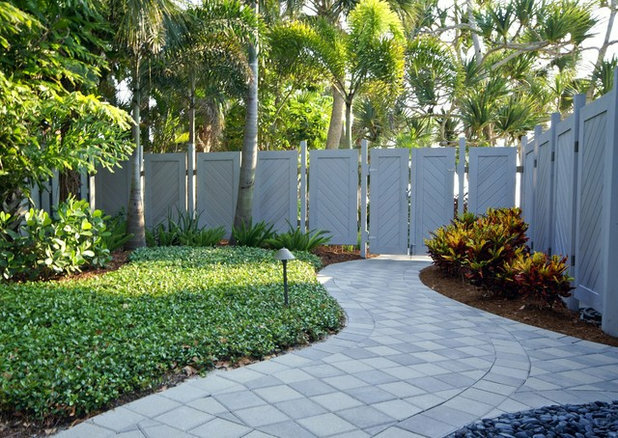 Many homeowners associations prefer this commonplace fencing material, as it blends in better with the landscape than some of the other more unusual styles. When not to use: As with the previous styles, the verticality of this fence pulls the eye upward, so use it thoughtfully with regard to dwelling height. Points to consider: This type of fence will need to be resealed, painted or stained at regular intervals to preserve its appearance and durability. 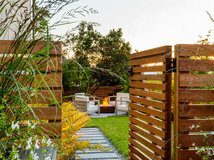 When planting in front of a solid vertical wooden fence, consider a contorted tree or vine as a focal point. Plants like weeping blue atlas cedar (Cedrus atlantica ‘Glauca Pendula’, zones 6 to 9), contorted filbert (Corylus avellana ‘Contorta’, zones 4 to 8) or American wisteria (Wisteria frutescens, zones 5 to 9) are good choices. This style of wooden fence has all the benefits of the vertical wooden fence but brings a more customized style to the landscape. 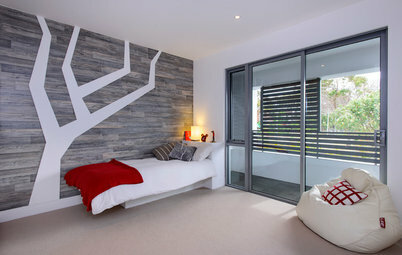 The lumber width can be varied to create a plethora of unique patterns, which is possible with the vertical wooden fence but oftentimes more successful with horizontal slats. 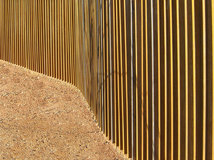 When to use: This fence is a great choice for a low building, as it keeps the eye low and moving around the space. It also feels warm and soothing to the garden visitor, not unlike a hug. The degree of privacy can be manipulated by the spacing of the lumber. 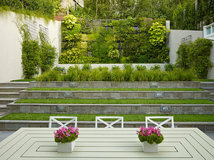 Notice how the lines of the fence shown here mimic the lines of the home’s siding, producing an undeniably homogenous connection between house and garden. When not to use: Although this style is adaptable, be mindful of the fact that it may not work well with very tall or very traditional buildings. Additionally, it would fight against vertical siding. Points to consider: As with all wooden fences, ongoing maintenance is a consideration. For plantings with a horizontal fence, consider espaliered trees or shrubs with a distinct horizontal growth habit, such as ‘Vintage Jade’ distylium (Distylium ‘Vintage Jade’, zones 6 to 9). Stone walls are chameleons; they can adapt to so many styles and play well with so many other materials. 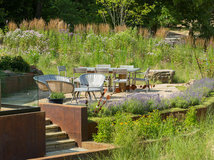 They can be built low for seating walls or mortared and built high enough to provide privacy in a backyard. Stone can also be caged inside fabricated metal to produce a modern or industrial gabion wall. 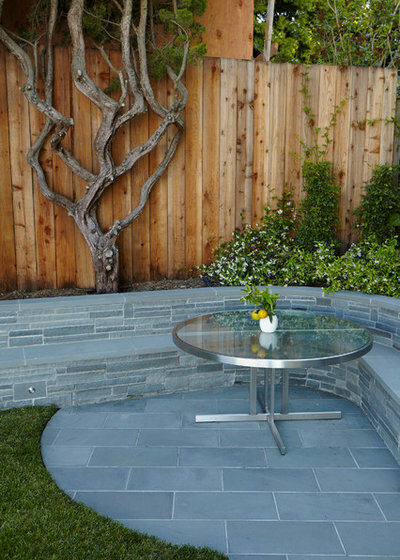 Add interest to the hardscape by juxtaposing rough stone walls with cut stone, as shown here. When to use: Stone walls are pricey, both from a materials and a labor standpoint, but outpace the competition in the right situation. Properly chosen stone can pull gray, blue, tan, orange or copper accents from the house to create home and garden continuity. When not to use: Using stone and brick in close proximity can be tricky. In tight spaces, the thickness of a stone wall can take up precious square footage. 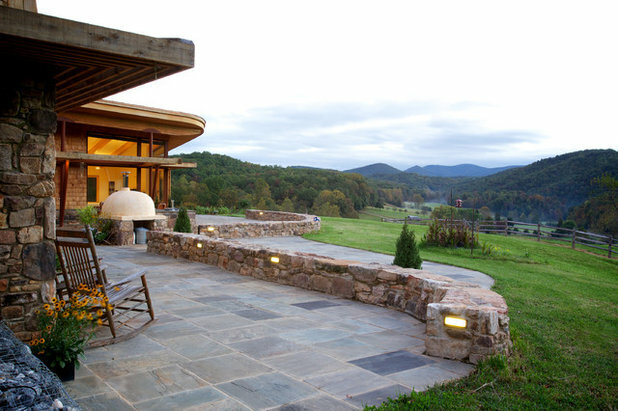 Points to consider: It is recommended that a professional install a stone wall. Some commonly available stone can crumble, so be sure your stone is dense and is rated for your area. 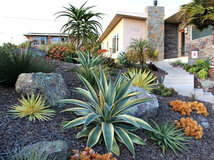 When planting around a stone wall, don’t overlook the opportunity to incorporate hues from the stone in leaf color. 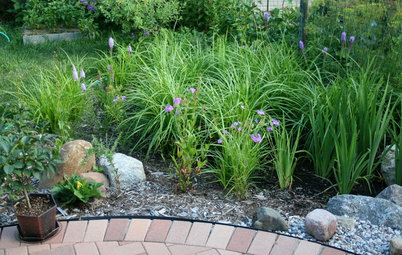 Gray stone contains blue tints and works well with blue-needled conifers, such as ‘Blue Ice’ Arizona cypress (Cupressus arizonica ‘Blue Ice’, zones 6 to 9), and perennials, such as Firewitch cheddar pinks (Dianthus gratianopolitanus ‘Firewitch’, zones 3 to 9). Tan and orange stone works well with ‘Tamukeyama’ Japanese maple (Acer palmatum var. dissectum ‘Tamukeyama’, zones 5 to 8) and ‘Center Glow’ ninebark (Physocarpus opulifolius ‘Center Glow’, zones 2 to 8). The fact that blue and orange are complementary hues on the color wheel means that you can mix these plants up with great results. 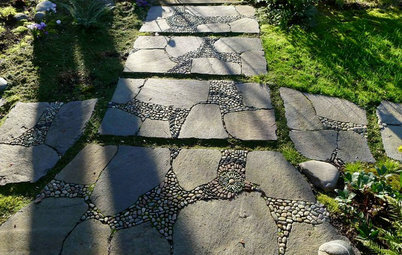 Poured concrete, particularly board-formed, has recently come into style. 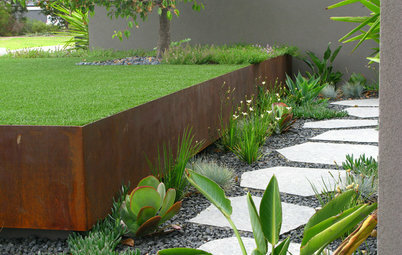 Once used for foundations and industrial applications only, these walls are now used in landscape design as focal points. When to use: Poured-concrete walls should be installed only by qualified professionals. They are expensive but impressive. 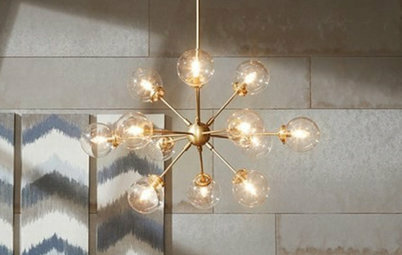 These walls are at home with contemporary and industrial homes and can be placed in close proximity to gray stone with interesting textural results. 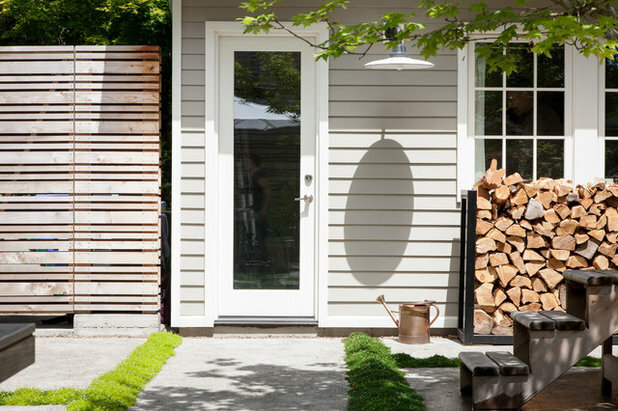 When not to use: These walls do not play well with traditional homes or those with wood siding. 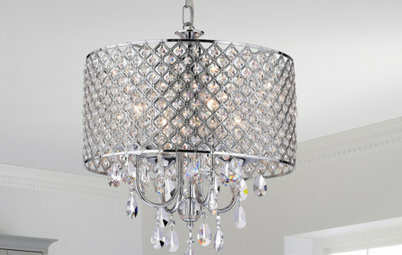 They are, however, spectacular when combined with steel and glass. 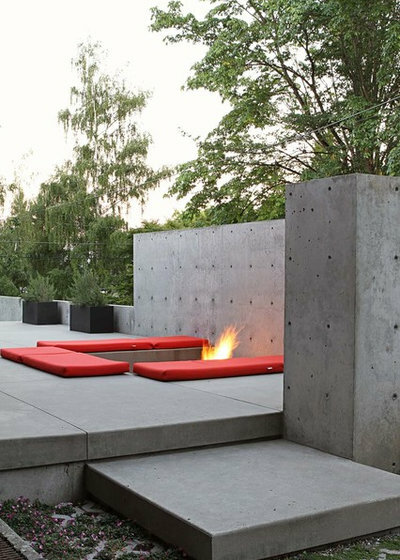 Points to consider: Gray concrete walls can be planted using the same palette as gray stone. If you want a more unusual concrete color, talk with your contractor about tinting your concrete. 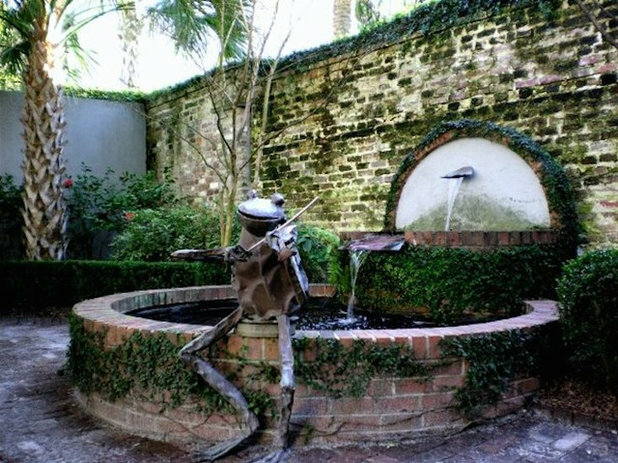 Brick walls tend to transport the mind to places like Charleston, South Carolina, or the Gulf Coast. 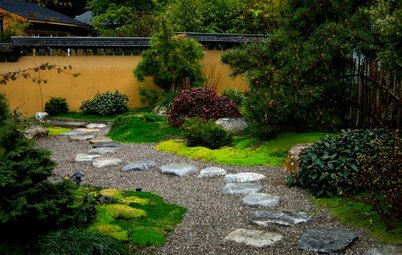 In shady locations they can be left to age and grow moss, as shown here, or can be painted for a more updated look to form a connection with more contemporary architecture. When to use: Brick walls are at the upper end of the cost spectrum but, when properly installed, can last for many generations. They are easily cleaned and maintained. They can be installed as a solid wall or contain patterns formed by negative space. When not to use: Brick walls generally do not play well with with stone houses or very contemporary homes. Points to consider: A proper footing is vital to the longevity of a brick wall. Without this the wall can crack and crumble. When choosing a planting scheme to complement an unpainted brick wall, consider the predominant hues of the brick, or go with dark green for a more traditional look. Let your imagination run wild with this type of fence. Panels can be made of wood, polycarbonate, steel, concrete board, bamboo, willow and more. Hide the framework or use it as an architectural accent. Set panels with or without gaps so you can plan for the amount of privacy you prefer. When to use: Use a paneled fence to set the mood in your garden if your outdoor space reflects the architectural style of your home. Bamboo or translucent polycarbonate panels can evoke the feel of a Zen-inspired garden, while rusted steel can evoke the feel of an industrial one. When not to use: If your garden has a style that is antithetical to your home’s architectural style, you may want to go with a more neutral-style fence. If you choose to live large and express yourself, be prepared to find out that some homeowners associations and neighbors may not share your enthusiasm for your creativity. 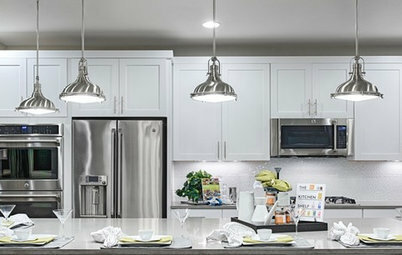 Points to consider: Consider the life expectancy and future maintenance of whatever panel material you choose. 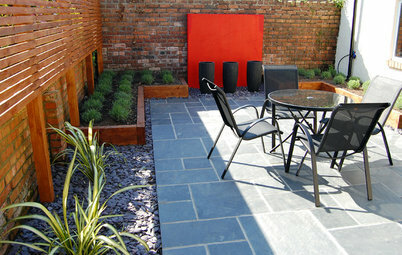 Create a planting scheme reflecting the color, texture and style of your chosen panels.